The Johnson Diversey Softcare Line H9 Dermasoft cartridge refill system. The cartridge is conveniently held in its own individual box keeping it safe and secure. The H9 cartridge is a refill system and is designed to offer hand cream for soothing chapped, dry and cracked hands. 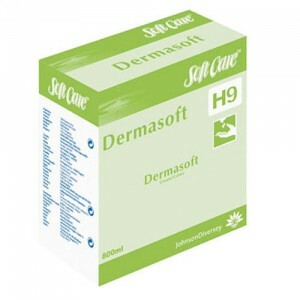 The H9 Softcare Line range comes with a whole 800ml of dermasoft cream per cartridge. The pack has 6 cartridges price is per pack.